What is Wi-Fi NOW all about? We’ve invited independent, thought-leading analysts to present their views – and we’ll hear from some of the world’s biggest operators embracing Wi-Fi. Will Wi-Fi disrupt the mobile paradigm, and if so how? Or will carriers converge fixed, mobile and Wi-Fi to stay competitive and give consumers what they want? Monetization with ad-tech and analytics is moving from experimentation to real business value. Free and freemium Wi-Fi can be profitable. We look at all the new technology out there, the challenges, and the best ways to address the mass market. Hotspot 2.0 (NGH) Or OTT? Seamless connectivity, security, and roaming. That’s what Hotspot 2.0 (NGH) provides. But Hotspot 2.0 is not the only option out there. We take a look at how intelligent device clients and apps are gathering momentum among carriers and other types of service providers. New Wi-Fi standards like 802.11ac Wave 2 are blazingly fast – but not all Wi-Fi is created equal. We look at all the great innovations out there for boosting performance and taking Wi-Fi services to the next level indoor and out. Retailers and venues of all kinds are looking for new ways of attracting and engaging consumers. A host of creative start-ups and some big vendors are on track to deliver the next generation connected consumer experience with Wi-Fi. Cities have a great deal to gain from offering free public Wi-Fi and some are already doing it and doing it well. Education, government, and institutions of all kinds are embracing seamless Wi-Fi services like never before. We talk to the experts about how to get all of that right – and about visions for the future. Wi-Fi calling is a done deal for many Tier 1 carriers – but there’s more than one way to build the service. We will be zooming in on the business case, the retention value, and the technology with the help of leading carriers using Wi-Fi calling today. Wi-Fi security is a big deal because it’s a real threat to the proliferation of public access Wi-Fi. With help from some of the world’s leading security experts and specialised technology vendors, we will take on the Wi-Fi security challenge. A Wi-Fi core network is the heart of your service fabric – whether you are a cable operator, an MNO, or any other type of service provider. And architectures are quite different depending on what you want to achieve. 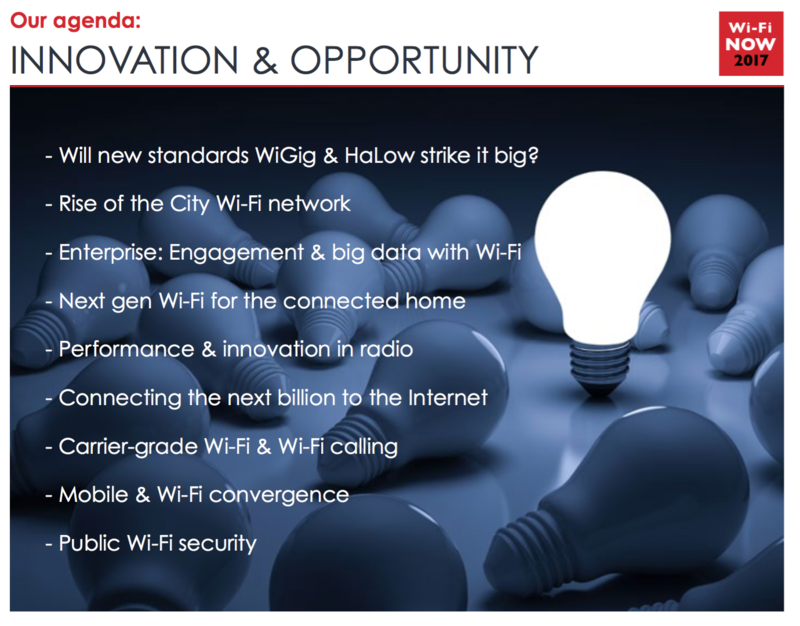 The established vendors and the challengers will be on hand for a deep-dive into Wi-Fi core technology. LTE-U/LAA vs. Wi-Fi – Is It A Real Threat To Wi-Fi? Well – I probably don’t have to tell you what my opinion is on this. But there’s still a big telecoms community out there pushing LTE-U and LAA. We will have a look at what this technology can and can’t do and if it’s a threat to the continued success of Wi-Fi.